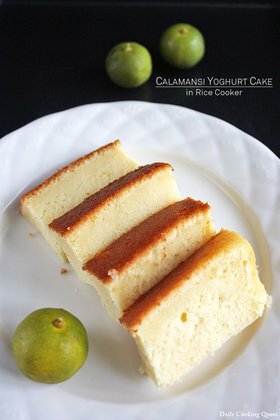 This is my third post on rice cooker cake, if it bores you out already, feel free to skip and just browse my other recipes, okay? 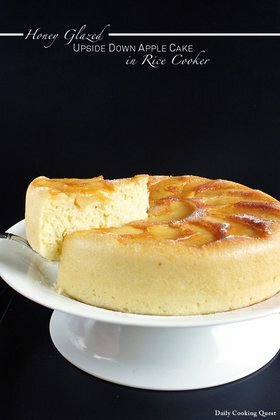 :) If you are still with me, than I will just say that I love baking in a rice cooker. It just cannot get any easier, I use the pot that comes with it, and since it already has a teflon coating, I don’t even have to grease the pot to ensure the finished cake slides out easily. I live in a teensy little apartment and counter space is premium, so having my rice cooker do a double duty as an oven is a real life saver. First, saute pinapple rings, brown sugar, cinnamon stick, and cloves in a pan. Okay, now onto the cake. 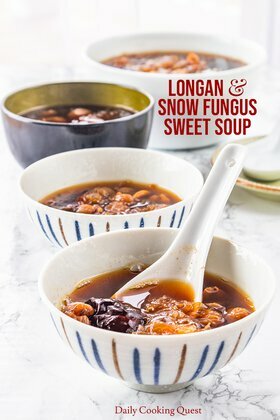 First, Chinese New Year is fast approaching, and instead of the usual pineapple cookies (Indonesian: nastar), I will serve this instead. Why? Because on Chinese New Year, everyone in the family will visit each and every single other family member’s house to pay a New Year visit. The whole thing is quite ridiculous, and you will see why. Family A will be visited by family B, C, D, E, F, and so on. Then, family B will be visited by family A, C, D, E, F, and so on. Rinse and repeat from morning till whenever , which can be pretty late, mine usually doesn’t end until after dinner, which is like 10 p.m. in the evening and by then, I am ready to kick the shoes and just drop like a log. I wish we can all just gather round in a place, do a big potluck, and dispensed with the silly round robin. 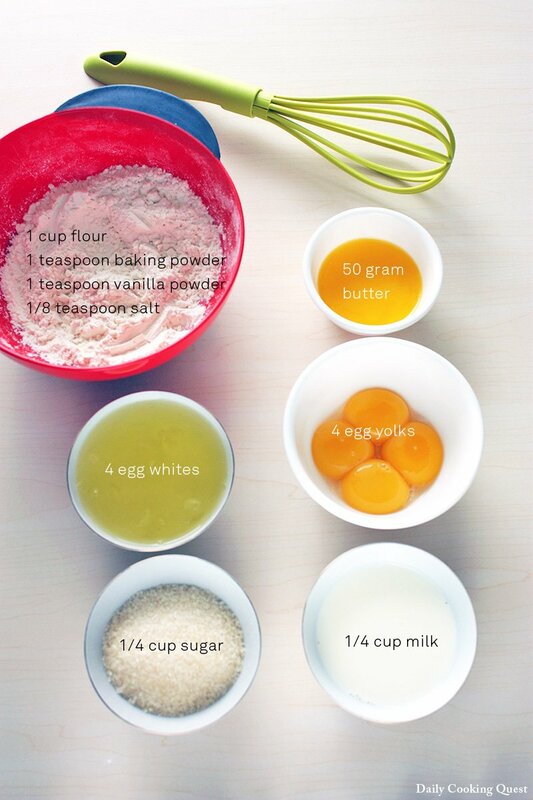 The rest of the ingredienst: flour, baking powder, vanilla powder (or essence), salt, butter, eggs, sugar, and milk. The finished batter, ready to be poured into the rice cooker pot. Instead of apples, I use fresh pineapples cut into rings. You can use canned pineapple rings if fresh ones are not available. I switch the honey with brown sugar. 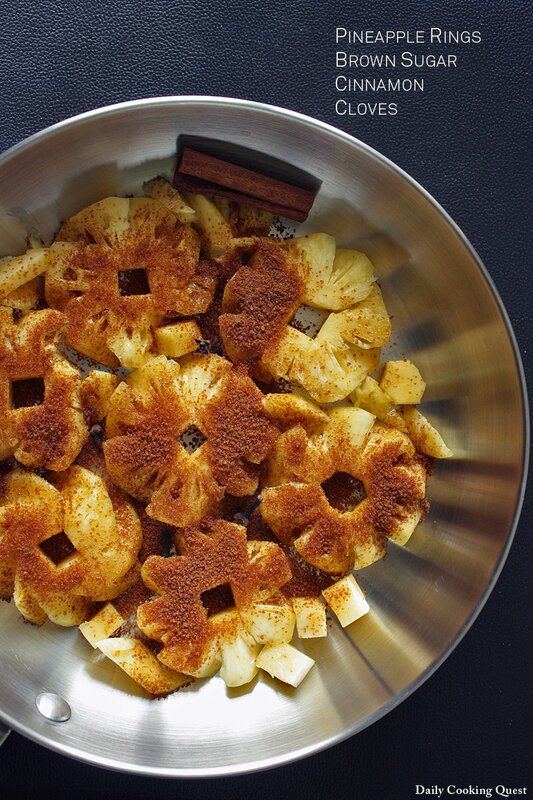 Place the pineapple, cinnamon, cloves and brown sugar on a pan and cook on low heat until bubbles. Once pineapple is softer but stiff firm, turn off the heat and set aside to soak up in the juice while you continue with your cake preparation. In a mixing bowl, whisk egg whites until medium peak while adding the sugar in batches, I usually do this in three batches. Then add the egg yolks, melted butter, milk, and vanilla essence into the egg whites. Mixing completely one by one before adding the next ingredient. Lastly, fold the dry ingredients with the wet ingredients with a spatula. Do not overdo this part or all that effort to aerate the egg whites will be wasted, just make sure that everything is well combined. 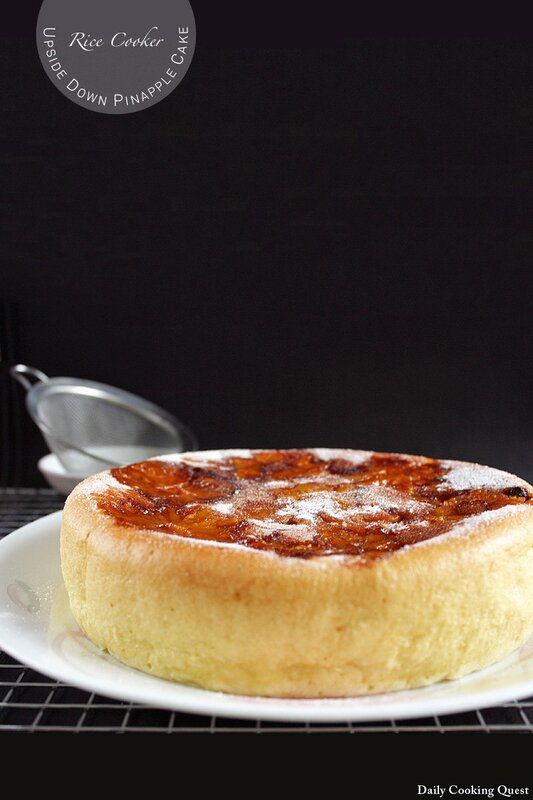 Place the pineapple rings in the bottom of your rice cooker pot, and reserve the cooking liquid to glace the cake. Pour the batter into the pot to completely cover the pineapples. Place the rice cooker pot into the rice cooker and press the “cook” button. Once it turns to “warm”, wait for 10 minutes. Repeat the “cook” and “warm” process another 3 times for a total of 4 “cook” and “warm” cycles. 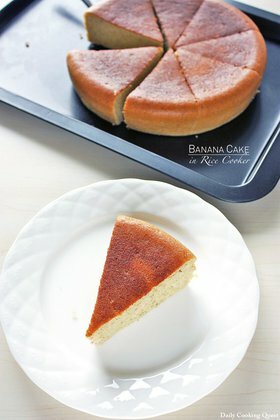 Open the rice cooker lid, and test if the cake is done by inserting a toothpick into the cake. If the toothpick comes out clean, it is done. If not, repeat the “cook” and “warm” cycle again until the cake is done. Remove the rice cooker pot, cover the pot with a plate wider than the pot opening, flip upside down and the cake should drop onto the plate. 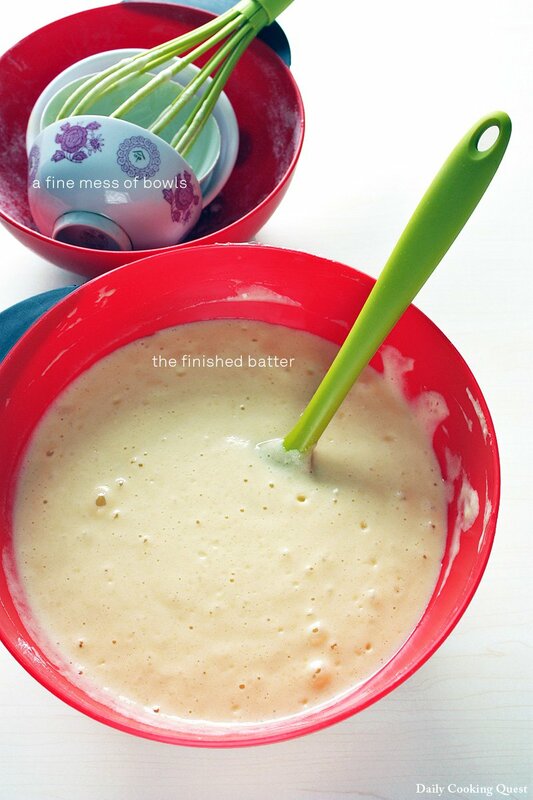 Lightly brush the top of the cake with the reserved liquid from cooking the pineapples. This helps the cake stay moist even the day after (if it lasts that long). Sprinkle with some powdered/confectioner's/icing sugar. oh dear,.. I love ur rice cooker cake recipes!! you are life saver! thank you!!! 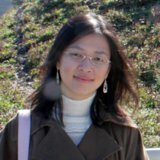 Hi Anita, what brand is your rice cooker and how big. It is regular rice cooker or electronic rice cooker. Hi Yudhi, I use a 10 cup Panasonic rice cooker. hi, If you are not using raising agent then it won't rise. It will be flat and little rise. There is not space to rise. Hi Melinda, the recipe calls for 1 teaspoon of baking powder :) Hope this helps. hi anita, i want to ask if i put fresh pineapple to rice cookers teflon (without cooked with brown sugar first) and then batter, is the taste of cake will different with pineapple that cooked with brown sugar first.